Emily Fifer and Heather Sperling make me want to get in the kitchen and cook. 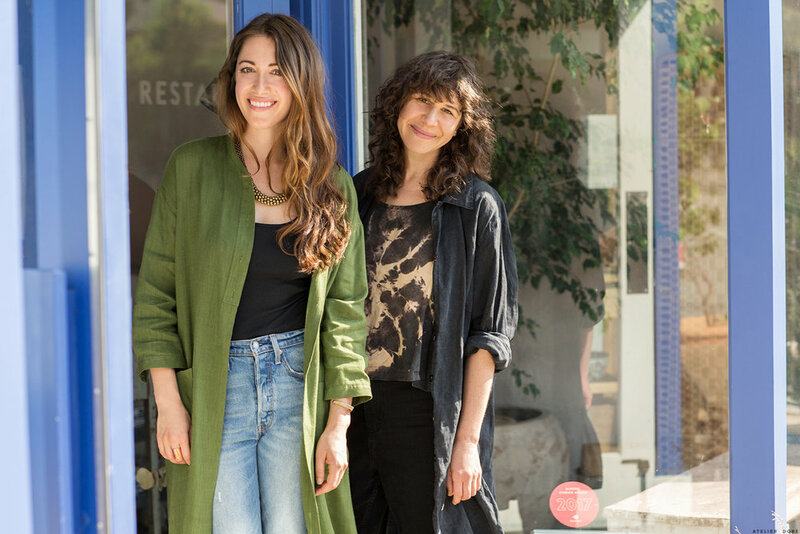 The two women are the forces behind Botanica – a beautiful vegetable-centric restaurant (and market! and website!) on the east side of LA that was born out of the desire to nourish people to their core. Each with a rich background in food – eating it, observing it, writing about it – Emily and Heather have mastered their vibrant approach to serving food. Botanica is an inspiring reminder of the magic that exists within the rituals and joy of creating and sharing a meal. On top of being vibrant, kind, and intelligent participants of the food scene, Emily and Heather are also passionate about community, inside their restaurant and beyond. Dream! So while I’m really wishing I lived in LA right now, I’ll settle for taking pleasure in the interview and recipe they graciously shared with us today. I hope you love it as much as I do! Describe Botanica in 3 words. What were the most important characteristics you wanted Botanica to have? We knew we wanted the space to feel like you were walking into someone’s home. Some of our favorite restaurants around the world provide that feeling of ‘I never want to leave this place. Can I move in? !’ To evoke that feeling, we incorporated texture, patina and warmth via paint, ceramics, personal pieces from our homes and lots of plant life. In terms of our food, our biggest goal is to provide nourishment and abundance on the plate using California’s most beautiful vegetables (and smaller doses of sustainably caught and raised seafood and meat). We want diners to feel totally satisfied, like they’ve had a feast, but still feel great the next day. It’s entirely possible to indulge, as long as the food you’re indulging in is cooked with an undercurrent of healthfulness! We work every day to prove that hypothesis. Lastly, we take the internal workings of our business — the health and happiness of our staff — into careful consideration. In order for us to be truly successful, we need to take care of the people who work with us, as well as the people we’re cooking for. We provide healthcare to our employees, we give a percentage of food sales back to our kitchen staff, we prioritize happiness and health, and work extremely hard to create an atmosphere of respect, support and openness. Can you describe the two Botanica spaces – what are their objectives, and how do the coexist? The restaurant is open all day, serving breakfast, lunch and dinner, and brunch on weekends. Our goal is to provide delicious meals that are comprised mostly of vegetables, using the highest quality ingredients. If a guest walks away having a greater reverence for vegetables — especially someone who’s convinced they can’t be satisfied without meat — then we’ve done our job. We also want people to be excited and delighted by what they’re eating at every turn, whether it’s a salad at breakfast or a dessert that’s crazy indulgent but uses no refined sugar and alternative flour. In addition to the food, we strive to provide personal, genuine hospitality, which can only come from a staff that feels excited and engaged (luckily, ours does!). The market at the front of the restaurant provides another way for guests to engage with the food we cook and the ingredients we use in the kitchen. We sell all of the natural wine and beer that we serve in the restaurant; some of the local produce that we buy from farmers each week: local sheep’s milk yogurt, cheese, eggs, bread and olive oil; and a host of Botanica-made items, including granolas (cacao-coconut and date caraway pumpkin seed), marinated olives, romesco, salsa verde, whipped tahini, beet muhammara, dukkah, chile oil and more. We want people to be able to provision for their own kitchens and cook for themselves! For that, they can head to BotanicaMag.com, where many of the recipes live. We also have an incredibly special coffee and tea program, available to-go all day from the market counter. Our coffee comes from Coffee Manufactory (Tartine’s roastery operation, soon to be located in LA) and we source our tea from San Francisco’s amazing Leaves & Flowers. We’re extremely passionate about both producers and want everyone to learn about them and love them as much as we do! What is the easiest way to take a simple dish to the next level? Sea salt, lemon/lemon zest, and a delicious finishing oil are often all you need. We cannot stress the importance of proper seasoning enough! It makes all the difference in the world, whether it’s on an arugula salad or a slice of tomato or a piece of grilled fish. And sea salt, lemon and olive oil go with everything.